The big marketing buzzword of 2017 was empathy, and it exists as several different forms in a marketer’s toolbox—from strategy to solution—all with unique capabilities and responsibilities. In thinking about strategy, we all know there are many successful methods to help guide marketing efforts. You can dig into a S.W.O.T. analysis, conduct interviews, or host a focus group, just to name a few. Another approach leans into a larger movement to bring more consciousness and understanding to marketing—having empathy. As humans, we already have some great insights into how other humans think. 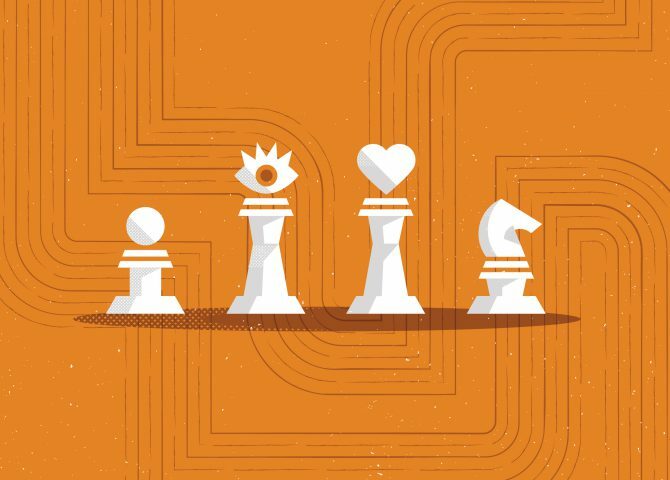 Now it’s putting that brain (and heart) to work for your brand. Gone are the days of sitting around the conference table generalizing your target audience into basic buyer personas. Bye, Felicia Founder and Enterprise Eric. In 2018 it is more important than ever to really know your audience have a deeper level of understanding with them to earn their trust and win their business. This is where empathy comes in. Beyond considering their role and demographics, really challenge yourself to think through their goals and pain points. Consider a key group of people in your audience and try to empathize with their thoughts and feelings as well as with what they’re saying and doing. Although this may sound a lot like the process of creating a marketing persona, the key difference here is the importance of stepping out of your own persona as a brand manager or marketer on a mission, and thinking like a person instead. Putting these thoughts to paper is a tried-and-true method of UI/UX designers who have adopted a similar approach to map out user experiences. It’s crucial for them to consider a user’s thoughts and feelings while interacting with an app or website in order to organize information, design with hierarchy, and craft the right messaging for a positive experience. Think about the last time you used an app or visited a website that you absolutely hated. Were you stressed out before you even got there? Was that why you were using the app in the first place? Did the bad user experience drive you away? Did you throw your phone out the window? The answers to these kinds of questions make for valuable insights. A great user experience is characterized by a frictionless process and a positive outcome. By having empathy for the thoughts and feelings of users like you, the UI/UX gurus of the world have tapped into the greater human experience to develop programs we not only enjoy using but rely on everyday. Asking questions like this and framing them around how your audience interacts with your company or organization could bring out some interesting responses. Maybe here you start to discover some unique pain points that can be addressed in a new way, or a gap in your messaging that can be filled with a new campaign. By bringing empathy into the conversation surrounding your brand and marketing, you are taking a stance to live up to your brand promise and making a commitment to your audience. The best part is, simply by enjoying the little things in life, working for the weekend, or whatever it is you do, you’re already wired to the human network through empathy. Use that power for good and see what new insights you can find.